Paige's Page: Picture Pets- Pet-a-Palooza Contest! Boomer was a special gift from an wonderful person. Boomer is my favorite pet, He lives in my WUS house "Wizard University of the Spiral". Boomer likes the library this is where he can sit and read, have some tea and visit with all the nice young Wizards who come to visit him. This Contest is now closed Winners will be posted Monday 17th before 6pm Central. In a new topic. Frame your Pet contest From June 1, 2013 - June 16, 2013. Take a picture of you and your favorite pet. Frame it how ever you choose .You may use kizoa.com If you like they have some really nice frames or make one yourself. * Take a screenshot of your Wizard and your favorite Wizard101 pet. * This contest begins June 1, 2013 and ends June 16, 2013 at 6pm (Wizard101) Central time. *Write a paragraph about your favorite pet. Why is this pet your favorite? 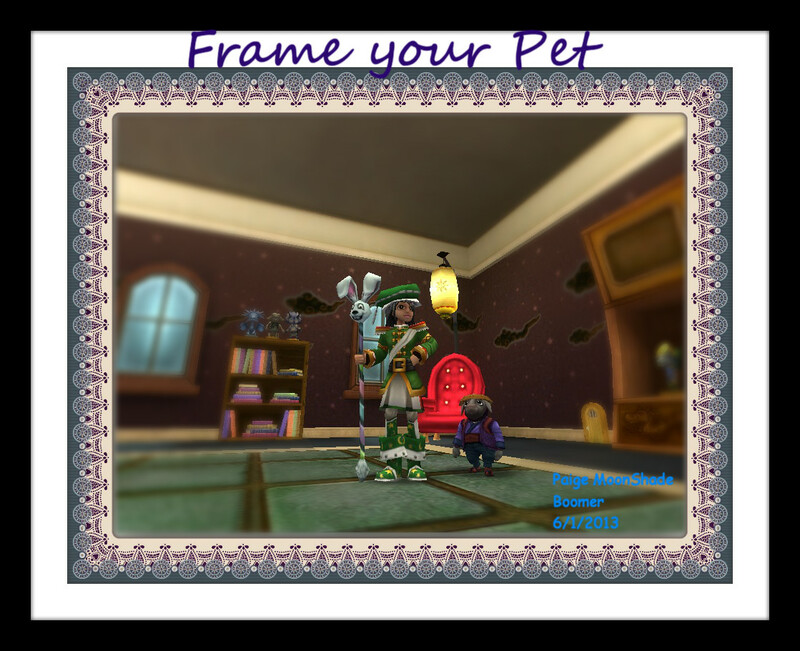 *Send your framed picture to Contest@paigemoonshade.com with title "Picture Pets." *Take your time you have until June 16,2013. * Codes are one time use, and may only be used one per account. For Kingsisle version of Wizard101 game. Question: Is cropping allowed? I took my picture, but there is another player on the other side of the picture that I want to crop out. Is this ok? Would it be okay if it showed nothing but the shoulders up with you and your pet? Like a close up picture? or does it have to be a full body picture? So does that mean that it has to be full body? Because I already took the picture and it shows the wizard and the pet, just not full body. Do you have to have their names somewhere in the picture? What if I have the names above their heads and just the date in one of the corners? It would still have the names and the date in it just not all together in one corner. Am I allowed to make a collage? It would still have me and my pet in it. Sure you can, Be creative. Take a screenshot of your Wizard and your favorite Wizard101 pet. In paint or on some places like the one I post allow you to add text. Your framed picture needs to have your wizards name , pets name and date. Can it be a plain and simple frame? Does it have to be a big exciting frame? Because i couldn't find any good frames that would go with my picture. It can be as simple as you like or the most creative. It does have to follow the rules stated in post. One question. How do one enter the contest? Cause this is my first time. Follow the "How to enter" Instructions. Posted in topic above. So the link contest@paigemoonshade.com is a e-mail? Yes that is the contest email you send entry to. If you are under the age of 13 please have your parents or guardians permission. Follow the contest rules and send in entry. Um should the date be the date when you made the picture frame or when your gonna send it to you? Either works. Cant be before May 31st because that is when contest was posted. How many screenshots and how many pets? Do they have to be full body pictures? Can we re-enter our entries if we forget something? If you forgot something. Send a email stating. You may not re-enter a new entry. I will allow one fix Lets say if your picture didn't come through or you forgot your paragraph. Do you want the picture as an attachment in the email or embedded? can we make a collage with different dates, cause as far as i remember, i started off with that pet, and still have him, now that i am level 90. i have old memories too. Hey Paige, I was wondering if you got my entry. ( sent from Julia Dreamcaster ) My internet was acting weird when I was sending it, and not sure if it went through. Thanks! Auto Reply? Does that mean if we didn't get an Auto Reply you didn't get our submission? I sent mine yesterday through Kizoa and am not sure whether you received it. Would you please check? It is for Amy Iceslinger with pet egg Sugar. If not I will re-send. Hello Paige! I was wondering if you received my entry. The first time I sent it the attachment didn't attach. It was Joseph LionCatcher, with King Shadow. thanks! I have send My pic On Contest@paigemoonshade.com but i think i forgot to frame it. What should i do now? I received it. Contest is now closed. looking forward to seeing the winners, mine was sent under corwin hawkbane, a neat behind the scenes on my pic: it's in the acropolis house. me and luke fireheart were scouting out the sky for a new castle area and i jumped off the rugs for a quick snapshot!